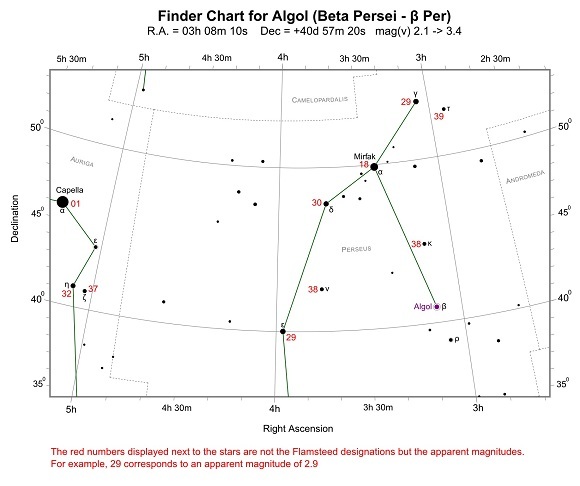 For those new to variable star observing, Algol is an excellent first choice target. It dims quite dramatically and the regular brightness changes are obvious to the naked eye. The table below contains date and time information of Algol's minima for September 2016 for various World time zones that cover most regions of Europe, America, China and Australia. For time zones not listed, local eclipse times can be calculated by adjusting the table to fit to the observers local time.